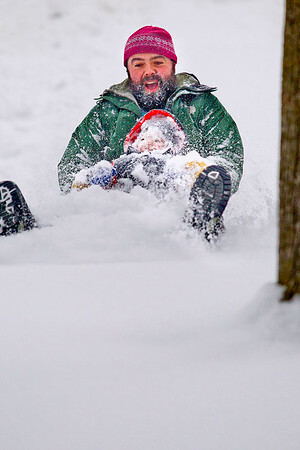 Elliot Seidner, 2, gets a face full of snow while sledding with his father, Andres Seidner, at Hannah Park in Traverse City. Andres Seidner said the two have gone sledding at the Grand Traverse County Civic Center in the past. "He said, 'let's do something we've never done before,'" said Andres, so the two tried a different park.